One evening in The Pinnacles of Western Australia I found this little hole in one of the limestone formation that provided a unique view of this otherworldly place. I didn't however get lucky with weather conditions until my 4th attempt and 4 hour round trip to this location. 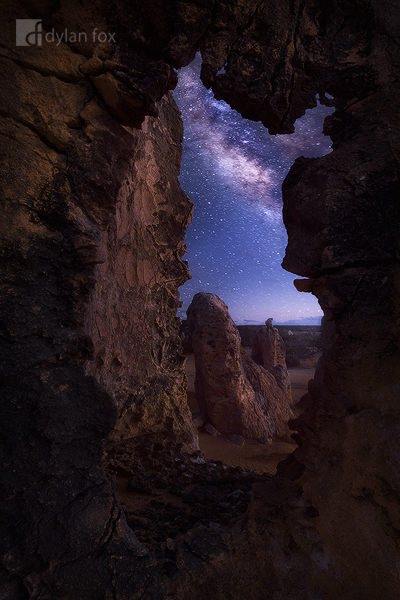 The pinnacles lend themselves so nicely to be photographed under the milky way as it compliments this bizarre landscape. It is always a little spooky being out there alone at night and becomes a little worrying when a couple hours after last-light, you see the headlights from a car coming in the long entrance road off the highway... Secure your limited edition, Pinnacles photographic print, 'Window To The Galaxy', by selecting your desired print size in the menu to the right.